These guidelines are to assist architects, planners, City project managers, private property owners, local government agencies, and the public to better understand: (1) where and how sidewalk bicycle parking racks should be installed to optimize limited space; and (2) what types of bicycle racks work best. The intent is to balance comfort and quality with the growing need for bicycle parking spaces in high-demand areas. 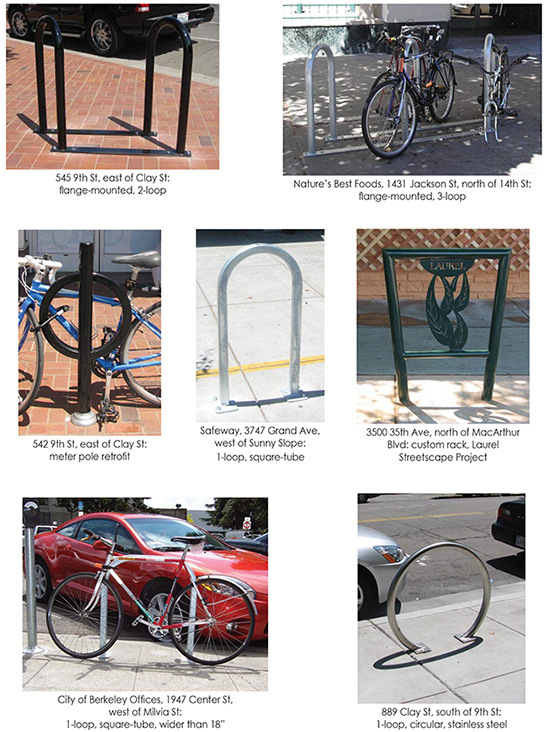 The guidelines have been used to create Oakland’s Bicycle Rack Layout & Installation Details. located within 50' (and no more than 120') of the destination they serve. placed in a visible area with significant foot traffic. positioned with consideration to the conditions of each site. The criteria listed below are the basis for the City's Bicycle Rack Layout & Installation Details, and typical for sidewalk installations. Sidewalk width, the location of sign, meter, and signal poles, tree wells, street furniture, in-pavement utility covers, and other sidewalk obstructions can limit but also help determine rack placement that minimizes impacts to pedestrian flow and enhances the aesthetics of the public right-of-way. Clearance: A minimum of 5-½' clear for pedestrian right-of-way outside from the footprint to the building frontage is required. More width is needed in areas of high pedestrian activity. The minimum distance from the rack will vary based on rack type and angle of placement. Racks may be sited adjacent to the building face, rather than curb, when the general building frontages on the particular block are irregular. Rack placement should always retain a clear and straight path of travel for pedestrians—a consideration especially important for people with visual impairments. Minimum Sidewalk Width: To achieve needed clearance, racks should be placed on sidewalks that are a minimum of 8-½' wide adjacent to parallel parking and 8' where vehicle parking is prohibited. However, in locations with high bicycle parking demand and narrow sidewalk width, racks may be installed 18” from the face of curb if there are adjacent obstructions, such as tree wells, that narrow the effective right of way. The minimum distances should be avoided to wherever possible to reduce conflicts between bicycles and vehicle doors. Spacing: Racks that are installed parallel to the face of curb should be spaced such that there is a minimum of 5' between the leading edge of the racks. Racks installed on an angle to the curb should be spaced such that there is a minimum of 3' between racks as measured perpendicular to the rack. Parallel orientation: For sidewalks between 8-½' and 12-¾', racks are typically oriented parallel to, and a minimum of 2' from, the face of curb. The distance from the curb face should be increased where possible. Curbside tree wells effectively narrow the pedestrian right of way and can allow racks to be placed further from the curb, reducing conflicts with car passenger doors. Diagonal orientation: The minimum sidewalk width for diagonal installations depends on the angle of placement and the width of the rack. Compared to perpendicular racks, such installations result in more room for pedestrians, but take up more room along the curb. Perpendicular orientation (shown, right): For sidewalks a minimum of 12-¾' wide (U-rack) or 14-¼' wide (circle-rack), such installations can be useful on wide sidewalks with high bike parking demand. The Bicycle Rack Layout & Installation Details provide spacing guidance that can be applied to the layout of racks installed adjacent to a building face, in parks, plazas, parking lots, playgrounds, etc. For installations adjacent to bus stops, see AC Transit’s bicycle parking guidelines. Where the demand for bicycle parking space outstrips available sidewalk space, in-street bicycle parking corrals can be considered. 1. Have a design that is intuitive for users. 2. Support the bicycle frame at two points. 3. Allow for the frame and at least one wheel of the bicycle to be locked to the rack. 4. Allow front- and back-in parking. 5. Accept a myriad of bicycle frame sizes and styles. 6. Allow for the use of a cable, chain, or U-type lock. 7. Not require the user to lift the bicycle onto the parking device. 8. Make each bicycle parking space accessible without moving another bicycle. 10. Be at least 32” tall and 18” wide (as measured from the leading edge of the tube). 11. Not have gaps that are between 3.5” and 9” in width (to prevent children from trapping their heads). 12. Include no sharp edges or moving parts. 14. Be fabricated from material that resists being cut or detached using common hand tools, especially those that can be concealed in a backpack, such as bolt cutters, pipe cutters, wrenches, and pry bars. 15. Be designed for secure installation. Flange-mounted racks: base plate should be a minimum of 3/8” thick; footers should be a minimum of 5” x 6” for square-tube racks/5” diameter for round-tube racks. In-ground racks: minimum 1.54” width pipe should extend a minimum of 10” below grade. Note: Any rack that doesn't conform to the specifications listed above must be approved by the City of Oakland Bicycle & Pedestrian Program prior to installation. Most bicycle racks pictured below comply with the outline above and are some variation on the inverted "U" design. Safe and convenient bicycle parking is essential to making cycling a good transportation option. On July 15, 2008, the Oakland City Council adopted an ordinance that requires bicycle parking in certain types of development. The ordinance indicates how bicycle racks, lockers, cages and showers will be included in new development and major renovations. The ordinance also requires bicycle parking attendants at public events with more than 5,000 participants. The City of Oakland encourages both private and public developers to provide bicycle parking facilities to supplement the City's grant-funded efforts. Free technical support regarding bicycle parking type, layout, quantity, and other considerations is available. Please contact the Bicycle & Pedestrian Program at (510) 238-3983 or bikeped@oaklandnet.com. To install racks on public property: Private property owners must apply for a minor encroachment permit. The total cost including application and other fees is $165.25. Download information packet (from FY15-16, still current in FY17-18). To install racks on private property: A permit may be required, depending on the type of installation. Contact the Oakland Permit Center for more information. Questions? Please contact the Bicycle & Pedestrian Program at (510) 238-3983 or bikeped@oaklandnet.com.